Do you believe that our subconscious mind rules most of what we say and do? We think we're doing one thing because we have to do it or want to do it and all the while we're practically operating on auto-pilot. From earliest childhood we are not in control. It's our subconscious that drives us, tricks us into thinking we know exactly what we're doing when we actually don't know. That's my theory for today and I'm not going to try to prove it one way or another. Besides, my subconscious mind is probably guiding my fingers as I type this. Whatever the case may be, that's where I'll credit the inspiration for my Monday post The Crappy Old Guy Waiter Restaurant. I wasn't really posting the story so much for the story as I was presenting the piece as a prelude to an upcoming event. But before I get to that event let me clarify my reference to the Original Pantry Cafe in downtown Los Angeles. It's true that the restaurant is one of the oldest in L.A. and they have some older waiters who have been there a long time. However the fact is that this is one of my favorite eateries in L.A. This is a place where I try to take out of town guests who visit me. The place has got a lot of character. Once you step inside you feel like you've been transported back to the 1920's. It's very cool And the food is downright good. Hearty portions of some of the best home-style American cooking you'll find anywhere. The old guy waiters are real pros who have provided quality service every time I've been in the place. If I were closer to the Pantry Cafe I'd eat there far more often than I do. If you visit L.A. and are near the Staples Center, make a point to go eat there. It's an original L.A. experience. That's my unsolicited endorsement. No one paid me to say this and no old guy waiters threatened me with harm if I didn't say it. Enough of my gushing--I need to get back to the topic. Subconscious mind actually rules us. That's why I wrote the kind of true and kind of made up post of Monday. Yeah, I think about getting older now and then and sometimes I think I'm succumbing to the throes of old age. Or maybe I should say settling into elderliness. Honestly I'm not ready to be reduced to just a piece of neglected furniture sittin' around the old homestead. I'm as young as I feel and that's youthful and vital. That's what I really feel. Except when I'm feeling old. Pass me the bottle and let me wallow in my crankiness if I need to, but I'm not ready to leave this old world yet. Oh, and why today's post and Monday's post? They're hinting at the next Battle of the Bands which comes tomorrow February 15, the day after that dumb love day that some people are so fond of celebrating. Besides the Battle of the Bands the other good thing that starts on the 15th is that the leftover Valentine's candy goes on sale. I'm not falling for that full price ripoff, I'm getting all mine on sale. Can you guess my song choice for Battle of the Bands? Do you think the subconscious mind is really in charge of us? Will you be stocking up on the on-sale Valentine's candy? Old Man Down the Road? We don't buy Valentine's candy. If it's not in the house, then we aren't tempted to eat it. The age old game of dodge ball at work, I see. Love your post! As for Valentine's wasn't he a war god? Sorry to hear you are battling the elderliness blues Lee! So is this feeling stemming from your conscious or unconscious mind? Acknowledge and shake it off. You are more vibrant and energetic than most people I know! I like the way you think about post V-Day candy. Who wants to pay for price for holiday items? Old age...way better than the alternative. I prefer to think in synchronicities. It isn't the subconscious but that part of ourselves that is in tune with everything else that helps to guide us. But the conscious mind always has the most control. I think everyone goes through the age blues but it;s how you handle it. As you say one is young as they feel. When I met you two years ago you had plenty of get up and go, and if I were to see you now you'd be the same. I remember Staples Centre when in LA. What a day to remember. I know people my age who say they're "old." It's all in your mind (the subconscious part, that is). I am going to guess the song is 'OLD MAN' by your buddy Neil Young, and you will put it up against any one of the number of more recent cover versions that have been recorded by bands I ain't never heard of before 3 minutes ago. There can be no question whatsoever that our subconscious mind plays a HUGE part in the things we do and say. However, it is by no means the only thing acting upon us; by no stretch of the imagination do I believe the conscious mind is fully slave to the subconscious. Of course, then we could also explore the concept of the superconscious mind, that which is more of a collective and operating even beyond the individual's subconscious, but that's a topic for anudder day. >>... Are you thinking of Phillippe's? That is precisely the place I had in mind while composing that comment. I did a Google "Images for..." search to make certain, and I recognized it in a heartbeat. I'm still not entirely sure who the old Rock star was I saw there whom my friend Pooh recognized very quickly but... upon further reflection... I'm fairly inclined to think that it was Ray Manzarek from 'The Doors'. Alex -- Not that song. MJ-- Dodge ball? I'm not sure I get the allusion. Shelly -- No he was a saint. Buck-- I was just under the weather but now I'm getting back in step. Kimberly -- I'm a candy fiend. There's always something around here. Liz -- May be so, but I still think the subconscious wields a lot of influence. Yvonne -- I've got to admit it's getting better. Steven -- I'm only old when I'm sick. I'm back to my young self again now. StMc -- I figured someone would think I'm going for the Neil Young song but I assure you that my choice is one that you will like much, much, much better. Who would ever recognize Ray Manzarek other than his close friends and relatives? If I were to meet him, he'd have to give me a lot of hints about who he was before I'd ever guess on my own. But that's the same thing you'd say if you were being held at gunpoint to say that, so how do I know if you're being forced to say it or not. It looked the same to me coming out. Which is the same for the subconscious. It doesn't really matter if it's in control or not because, if you decide, "wait! it's in control! I'm taking control away from it," that's your subconscious prompting you to do that. BotB tomorrow? Dang, this month got away from me. I suppose I'll have to give it a pass this time around. I wait for discount candy too, if I buy it at all. Got no sweetie and my kids are not my lover. Sounds like a great restaurant, and I'm sure that the seasoned waiters add a lot of character. My mom always kept a candy drawer in our house, and I've carried on the tradition. Just something else my kids can blame me for, when they write their book! Not trying to guess. Was nowhere near last time. Don't they say age is a state of mind. I am older than you are and I mostly don't feel old. My mother used to say the trouble with age is you don't feel it. Andrew -- I guess we're all either out of control on the conscious level or tightly reined in by our subconscious. Or more probably I'm just jabbering to be jabbering. 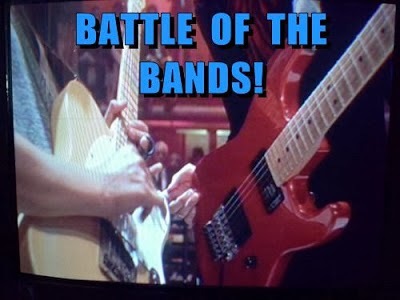 Donna - Remember, 1st and 15th every month--Battle of the Bands! Candy is now officially on sale. Julie -- Oooh, a candy drawer! I like your house. Jo-- Usually I don't feel old, but when I feel really bad like I have over the past month then I blame it on my age. That's what my doctor does. Hmm, maybe the song choice will be Neil Young's "Old Man?" Kelly -- Too obvious. When I give clues I do it crossword style. None of the words of the title are in the clues. I'm not buying into that age thing.